Cell Division: Mitosis and its stages. A basic understanding of Meiosis as a reduction division (stages not required). Significance and major differences between mitotic and meiotic division. Basic structure of chromosome with elementary understanding of terms such as chromatin, chromatid, gene. Structure of DNA and centromere. Cell division is a method by which new cells arises from pre-existing cells. Observe the given picture of a cut finger. Healing process is producing new cells. The new cells produced should be exactly the same as their parent cell. Chromosomes in the nucleus of the cell are the carriers of genetic information. Every organism has a specific chromosome number. The number of these chromosomes should remain same inorder to maintain the cell structure and function. Thus when a cell divides, the daughter cells should receive the same chromosome number. Before beginning with the process of cell division let us get familiar with the chromosome structure. Chromatin is a mass of genetic material composed of DNA and proteins that condense to form chromosomes. Chromosome is an organized structure of DNA and protein that is found in cells. Chromatid is the daughter strand of a duplicated chromosome that is joined by a single centromere. Chromatid has a highly coiled of DNA and proteins. This thread like structure is called chromonema. The DNA is coiled on proteins called histones. DNA coils around a core of eight histones forming a complex. This complex is called as nucleosome. James Watson and Francis Crick discovered the structure of DNA and were awarded the Nobel prize in 1962. Most DNA is present in the nucleus (nuclear DNA) and some DNA can be found in the mitochondria (mitochondrial DNA). DNA is made up of two long parallel strands that are helically coiled around an axis. The strands run in the opposite direction and is made up of repeating units called nucleotides. The bases are bonded with sugar molecules. The sugar molecules are connected by phosphate bonds, thus it forms a phosphate-sugar-phosphate-sugar backbone. The two chains of the DNA are held together by hydrogen bonds. These bonds occur between complementary nitrogenous bases. The base pairing is always between A - T and G-C. There are two hydrogen bonds between A-T and three between G-C. The DNA is packed with proteins to form chromosome. The record for minimum number of chromosomes belongs to a subspecies of the ant Myrmecia pilosula, in which females have a single pair of chromosomes. The record for maximum number of chromosomes is found in found in the fern family. Ophioglossum reticulatum This fern has roughly 630 pairs of chromosomes or 1260 chromosomes per cell. These are chromosome pairs of approximately the same length, and centromere position. Out of the pair one is inherited from the mother (maternal) and one from the father (paternal). These are two identical chromatids connected by a centromere. The metacentric chromosome has middle centromere forming two equal arms of the chromosome. The sub-metacentric chromosome has centromere nearer to one end of the chromosome resulting into one shorter arm and one longer arm. In acrocentric chromosome the centromere is situated close to its end forming one extremely short and one very long arm. The telocentric chromosome has a terminal centromere. FUNCTION OF CHROMOSOME- carry genetic information from one generation to the other. 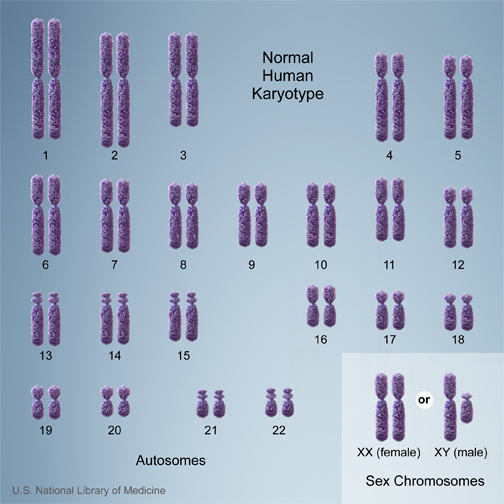 When the chromosomes of a person are arranged in an organised manner it is called a Karyotype. 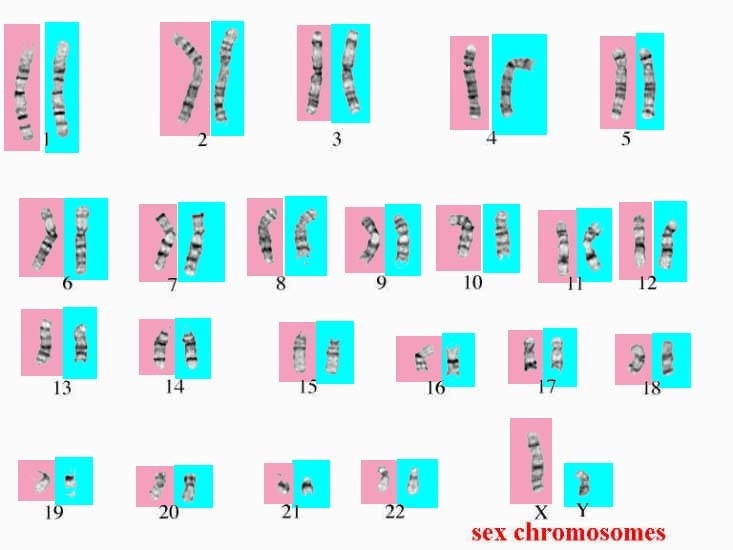 Here the chromosomes are arranged and numbered by size, from largest to smallest. This arrangement helps scientists quickly identify chromosomal alterations that may result in a genetic disorder. Cell absorbs nutrients and grows larger. No change in DNA content. Cell divides giving rise to two daughter cells that are identical to the parent cell and has the same chromosome number. Cell divides giving rise to four daughter cells with half the number of chromosomes. Sometimes there is direct cell division by simple cleavage of the nucleus, without spindle formation or the appearance of chromosomes. This type of division is seen in prokaryotic cells and amoeba. Mitosis is also called- Equational division. Mitosis is an equational division in which a single cell divides to form two daughter cells. The daughter cells are identical to each other and the parent cell in all respect. Mitosis maintains the chromosome number i.e, the daughter cells have the same number of chromosome as the parent. Growth period between two successive divisions. Synthesis of new genetic material. 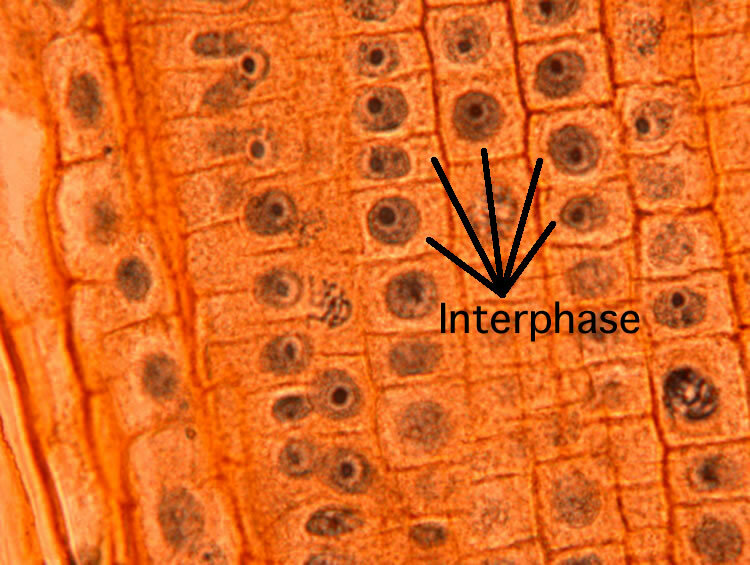 Interphase was earlier called as "resting phase" do you think this term is appropriate? Chromatin material condenses to form thread-like chromosomes. Centrioles start to migrate to the opposite poles of the cell. Two star like structures are formed at the poles from the radiating fibers. Chromosome shorten and condense further. Chromosome arrange at the equator, centromeres at the equator and arms face the poles. Spindle fibers attach to the kinetochores on the centromere. The kinetochore is the protein structure on chromatids where the spindle fibers attach during cell division to pull sister chromatids apart. 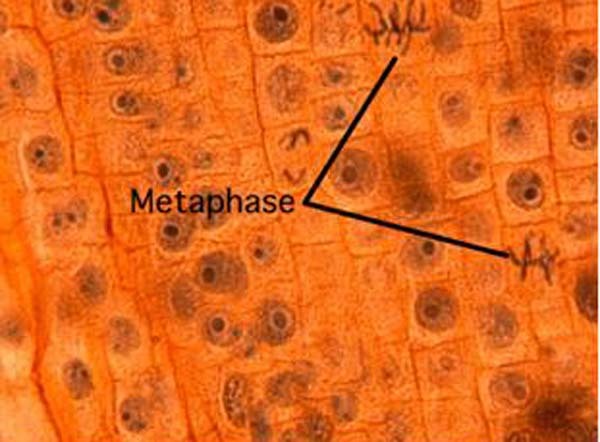 Metaphase plate is a plane in the equatorial region of the spindle in dividing cells, along which the chromosomes become arranged during the metaphase. Kinetochore microtubules are spindle fibers that attach to the kinetochores and move the chromosomes to the center of the cell. Polar microtubules are not attached to chromosomes but overlap each other. Asters are short microtubules that radiate from the centrosomes. Centromere divides such that two chromatids has its own centromere. The separated sister chromatids begin to move towards the opposite poles due to the contraction of spindle fibers. At the end of anaphase the chromosomes reach the opposite poles. Chromatids uncoil and change to chromatin network. The spindle fibers disappear and centrosome organises above the nucleus. It occurs in the region of meristems. Cytokinesis occurs by plate formation. 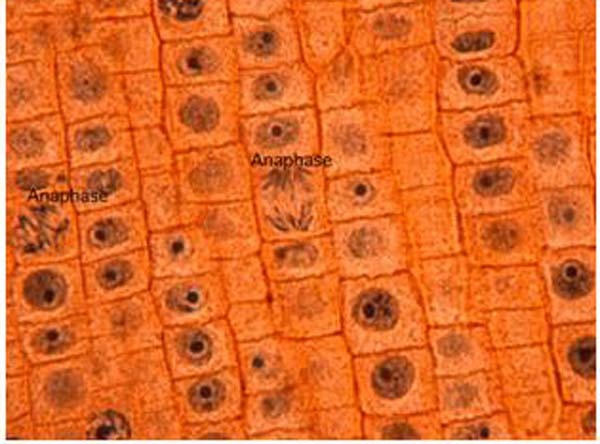 cell plate or middle lamellae cements the daughter cells. It occurs at several places. Centrioles are involved in division. What is the need for mitosis? Meiosis is a reductional division- chromosome number is reduced to half. Crossing over- Exchange of genetic material between non sister chromatids. Meiosis maintains definite and constant number of chromosomes in organisms.